The Afghan Armed Forces are the military forces of the Islamic Republic of Afghanistan. They consist of the Afghan National Army and the Afghan Air Force. The President of Afghanistan is the Commander-in-Chief of the Afghan Armed Forces, which is administratively controlled through the Ministry of Defense. The National Military Command Center in Kabul serves as the headquarters of the Afghan Armed Forces. The Afghan Armed Forces currently has approximately 200,000 active duty soldiers and airmen, which are expected to reach 260,000 soldiers and airmen in the coming year. The current Afghan military originates in 1709 when the Hotaki dynasty was established in Kandahar followed by the Durrani Empire. The Afghan military fought many wars with the Safavid dynasty and Maratha Empire from the 18th to the 19th century. It was re-organized by the British in 1880, when the country was ruled by Amir Abdur Rahman Khan. It was modernized during King Amanullah Khan's rule in the early 20th century, and upgraded during King Zahir Shah's forty-year rule. From 1978 to 1992, the Soviet-backed Afghan Armed Force fought with multi-national mujahideen groups who were being backed by the United States, Saudi Arabia, and Pakistan. After President Najibullah's resignation in 1992 and the end of Soviet support, the military dissolved into portions controlled by different warlord factions and the mujahideen took control over the government. This era was followed by the rise of the Pakistan-backed Taliban regime, who established a military force on the basis of Islamic sharia law. After the removal of the Taliban and the formation of the Transitional Islamic State of Afghanistan in late 2001 and 2002, respectively, the Afghan Armed Forces was gradually rebuilt by NATO forces in the country, primarily by the United States Armed Forces. Despite early problems with recruitment and training, it is becoming effective in fighting against the Taliban insurgency. As of 2014, it is becoming able to operate independently from the NATO International Security Assistance Force. As a major non-NATO ally of the United States, Afghanistan continues to receive billions of dollars in military assistance. Afghans have served in the militaries of the Ghaznavids (963–1187), Ghurids (1148–1215), Delhi Sultanate (1206–1527), Mughals (1526–1858) and the Persian army. The current Afghan military traces its origin to the early 18th century when the Hotaki dynasty rose to power in Kandahar and defeated the Persian Safavid Empire at the Battle of Gulnabad in 1722. "The sun had just appeared on the horizon when the armies began to observe each other with that curiosity so natural on these dreadful occasions. The Persian army just come out of the capital, being composed of whatever was most brilliant at court, seemed as if it had been formed rather to make a show than to fight. The riches and variety of their arms and vestments, the beauty of their horses, the gold and precious stones with which some of their harnesses were covered, and the richness of their tents contributed to render the Persian camp very pompous and magnificent. On the other side there was a much smaller body of soldiers, disfigured with fatigue and the scorching heat of the sun. Their clothes were so ragged and torn in so long a march that they were scarce sufficient to cover them from the weather, and, their horses being adorned with only leather and brass, there was nothing glittering about them but their spears and sabres..."
When Ahmad Shah Durrani formed the Durrani Empire in 1747, his Afghan army fought a number of wars in the Punjab region of Hindustan during the 18th to the 19th century. One of the famous battles was the 1761 Battle of Panipat in which the Afghans invaded and decisively defeated the Hindu Maratha Empire. The Afghans then engaged in wars with the Punjabi Sikh Empire of Ranjit Singh, which included the Battle of Jamrud in which Hari Singh Nalwa was killed by Prince Akbar Khan. During the First Anglo-Afghan War, British India invaded Afghanistan in 1838 but withdraw in 1842. During the three years a number of battles took place in different parts of Afghanistan. King Habibullah Khan with the military men of Afghanistan in the early 1900s. The first organized army of Afghanistan (in the modern sense) was established after the Second Anglo-Afghan War in 1880 when the nation was ruled by Emir Abdur Rahman Khan. Traditionally, Afghan governments relied on three military institutions: the regular army, tribal levies, and community militias. The regular army was sustained by the state and commanded by government leaders. The tribal or regional levies - irregular forces - had part-time soldiers provided by tribal or regional chieftains. The chiefs received tax breaks, land ownership, cash payments, or other privileges in return. The community militia included all available able-bodied members of the community, mobilized to fight, probably only in exceptional circumstances, for common causes under community leaders. Combining these three institutions created a formidable force whose components supplemented each other's strengths and minimized their weaknesses. After the Third Anglo-Afghan War ended, the reforming King Amanullah did not see the need for a large army, instead deciding to rely on Afghanistan's historical martial qualities. This resulted in neglect, cutbacks, recruitment problems, and finally an army unable to quell the 1929 up-rising that cost him his throne. However, under his reign, the Afghan Air Force was formed in 1924. The Afghan Armed Forces were expanded during King Zahir Shah's reign, reaching a strength of 70,000 in 1933. Following World War II, Afghanistan briefly received continued military support from the British government under the Lancaster Plan from 1945 to 1947, until the partition of India realigned British priorities in the region. Afghanistan declined to join the 1955 United States-sponsored Baghdad Pact; this rebuff did not stop the United States from continuing its low-level aid program, but it was reluctant to provide Afghanistan with military assistance, so Daoud turned to the Soviet Union and its allies for military aid, and in 1955 he received approximately US$25 million of military aid. In addition, the Soviet bloc also began construction of military airfields in Bagram, Mazar-e-Sharif, and Shindand. By the 1960s, Soviet assistance started to improve the structure, armament, training, and command and control arrangements for the military. The Afghan Armed Forces reached a strength of 98,000 (90,000 soldiers and 8,000 airmen) by this period. MiG-15 fighters and Il-28 bombers of the Royal Afghan Air Force in 1959. After the exile of King Zahir Shah in 1973, President Daud Khan forged stronger ties with the Soviets by signing two highly controversial military aid packages for his nation in 1973 and 1975. For three years, the Afghan Armed Forces and police officers received advanced Soviet weapons, as well as training by the KGB and Soviet Armed Forces. Due to problems with local political parties in his country, President Daud Khan decided to distance himself from the Soviets in 1976. He made Afghanistan's ties closer to the Greater Middle East and the United States instead. From 1977 to 1978, the Afghan Armed Forces conducted joint military training with the Egyptian Armed Forces. In April 1978 there was a coup, known as the Saur Revolution, orchestrated by members of the government loyal to the People's Democratic Party of Afghanistan (PDPA). This led to a full-scale Soviet invasion in December 1979, led by the 40th Army and the Airborne Forces. In 1981 the total strength of the Army was around 85,000 troops according to The New York Times. The Army had around 35-40,000 soldiers, who was mostly conscripts, the Air Force had around 7,000 airmen and if put together all military personnel in 1984, the total strength of the Afghan Armed Forces was around 87,000 in 1984. Throughout the 1980s, the Afghan Armed Forces was heavily involved in fighting against the multi-national Mujahiddin rebel groups who were largely backed by the United States and trained by the Pakistani Armed Forces. The rebel groups were fighting to force the Soviet Union to withdraw from Afghanistan as well as to remove the Soviet-backed government of President Mohammad Najibullah. Due to large number of defectors, the Afghan Armed Forces in 1985 was reduced to around 47,000. The Air Force had over 150 combat aircraft with about 7,000 officers who were supported by an estimated 5,000 Cuban Revolutionary Air and Air Defense Force and Czechoslovak Air Force advisers. Weapons supplies were made available to the Mujahideen through numerous countries; the United States purchased all of Israel's captured Soviet weapons clandestinely, and then funnelled the weapons to the Mujahideen, while Egypt upgraded their own Army's weapons, and sent the older weapons to the militants, Turkey sold their World War II stockpiles to the warlords, and the British and Swiss provided Blowpipe missiles and Oerlikon anti-aircraft guns respectively, after they were found to be poor models for their own forces. China provided the most relevant weapons, likely due to their own experience with guerrilla warfare, and kept meticulous record of all the shipments. Following the Soviet withdrawal in 1989 the Democratic Republic of Afghanistan continued to deal with attacks from the Mujahiddin. For several years the Afghan Armed Forces had actually increased their effectiveness past levels ever achieved during the Soviet military presence. But the government was dealt a major blow when Abdul Rashid Dostum, a leading general, switched allegiances to the Mujahideen in 1992 and together they captured the city of Kabul. By 1992 the Army fragmented into regional militias under local warlords because of the fall of the Soviet Union which stopped supplying the Afghan Armed Forces and later in 1992 when the Afghan government lost power and the country went into a state of anarchy. "The fall of the Moscow-backed regime in 1992 disintegrated the state as well as the army. Bits and pieces of the fragmented military either disappeared or joined the warring factions that were locked in a drawn-out power struggle. The warring factions were composed of odd assortments of armed groups with varying levels of loyalties, political commitment, professional skills, and organizational integrity." After the fall of Najibullah's regime in 1992, private militias were formed and the nation began to witness a Civil War between the various warlords, including Ahmad Shah Massoud, Gulbuddin Hekmatyar, Abdul Rashid Dostum, Abdul Ali Mazari, Ismail Khan, and many others. They received logistics support from foreign powers including Russia, Pakistan, India, Iran, China, France, Canada and the United States. When the Taliban took power in 1996, the warlords fled Kabul to the north or neighboring countries. With the backing and support of Pakistan, the Taliban began creating a new military force purely based on Islam's Sharia law. The Taliban maintained a military during their period of control. The Taliban Army possessed over 400 T-54/55 and T-62 tanks and more than 200 Armoured personnel carriers. The Afghan Air Force under the Taliban maintained five supersonic MIG-21MFs and 10 Sukhoi-22 fighter-bombers. In 1995, during the 1995 Airstan incident, a Taliban fighter plane captured a Russian transport. They also held six Mil Mi-8 helicopters, five Mi-35s, five L-39Cs, six An-12s, 25 An-26s, a dozen An-24/32s, an IL-18, and a Yakovlev. After the formation of the Karzai administration in late 2001, the Afghan Armed Forces was gradually reestablished by the United States and its allies. Initially, a new land force, the Afghan National Army (ANA), was created, along with an air arm, the Afghan National Army Air Corps, as an integral part of the Army. The ANA Air Corps later split off to become an independent branch, the Afghan Air Force (AAF). Commandos and Special Forces were also trained and formed as a part of the Afghan National Army. Training was managed initially by the U.S. Office of Military Cooperation, followed by other U.S. organisations and then Combined Security Transition Command-Afghanistan, and is now being run by the NATO Training Mission-Afghanistan. The Afghan Air Force was relatively capable before and during the 1980s but by late 2001, the number of operational aircraft available was minimal. The United States and its allies quickly eliminated the remaining strength and ability of the Taliban to operate aircraft in the opening stages of their invasion. With the occupation of airbases by American forces it became clear how destitute the Air Force had become since the withdrawal of the Soviet Union. Most aircraft were only remnants rusting away for a decade or more. Many others were relocated to neighboring countries for storage purposes or sold cheaply. The AAF was reduced to a very small force while the country was torn by civil war. It is currently being rebuilt and modernized by the NATO-led multinational Combined Air Power Transition Force of the international Combined Security Transition Command - Afghanistan (CSTC-A). There has been significant progress toward revitalization of the Afghan Armed Forces in the last decade, with two service branches established. The ANA and AAF are under the Afghan Ministry of Defense, which forms the basic military force. By 2006, more than 60,000 former militiamen from around the country have been disarmed. Most heavy weapons from Panjshir, Balkh, Nangarhar and other areas were seized by the Afghan government. In 2007, it was reported that the DDR programmes had dismantled 274 paramilitary organizations, reintegrated over 62,000 militia members into civilian life, and recovered more than 84,000 weapons, including heavy weapons. But The New York Times reported in October 2007 this information in the context of a reported rise in the number of hoarded weapons in the face of what has been seen as a growing Taliban threat, even in the north of the country. The ANA Commando Battalion was established in 2007. The Afghan National Development Strategy of 2008 explained that the aim of DIAG (Disbandment of Illegal Armed Groups) was to ban all illegal armed groups in all provinces of the country. Approximately 2,000 such groups have been identified and most of them have surrendered to the Afghan government or joined the nation's military. The NATO-trained Afghan National Army is organized into 31 Kandaks, or Battalions, 28 of which are considered combat ready. Seven regional corps headquarters exist. The National Military Academy of Afghanistan was built to provide future officers, it is modeled after the United States Military Academy and United States Air Force Academy. The Afghan Defense University (ADU) is located in Kabul province and consists of a headquarters building, classrooms, dining facility, library, and medical clinic. In addition to this, an $80 million central command center was built next to the Hamid Karzai International Airport. In 2012, Afghanistan became a Major non-NATO ally of the United States. Sizable numbers of Afghan officers are sent to be trained in India either at the Indian Military Academy in Dehradun, the National Defence Academy near Pune or the Officers Training Academy in Chennai. The Indian Military Academy which has been in existence since 1932, provides a 4-year degree to army officers, while the National Defence Academy is a tri-service college provides a 3-year degree after which officers undergo a 1-year specialization in their respective service colleges. The Officers Training Academy on the other hand provides a 49-week course to Graduate officer candidates. In 2014 the number of Afghan officers in training in India was nearly 1,100. A Total of 1,200 Afghan officers have been trained up to 2013. 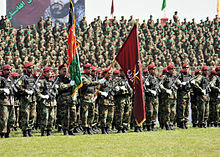 The total manpower of the Afghan Armed Forces was around 164,000 in May 2011. By September 2014 it has reached 195,000. Its Air Force has about 100 refurbished aircraft, which includes A-29 Super Tucano attack aircraft, Lockheed C-130 Hercules and Pilatus PC-12s military transport aircraft, as well as Mil Mi-17 and Mi-24 helicopters. It also includes trainers such as Aero L-39 Albatros and Cessna 182. The manpower of the Afghan Air Force is around 3600 airmen, including 450 pilots. It also has small number of female pilots. Former Defense Minister Abdul Rahim Wardak 2001–2008, Chief of the General Staff General Sher Mohammad Karimi, and Colonel Shah Mahmood Rauf Wardak. Large numbers of military bases are found all cross the country, including major ones in Kabul, Kandahar, Herat, Balkh, Nangarhar, Khost, Paktia, Paktika, Maidan Wardak, Ghazni, Farah, and many other provinces. Some of these were built by the United States Army Corps of Engineers (USACE) while others by ISAF and Afghans. It was reported in 2010 that there were at least 700 military bases inside Afghanistan but more were expected to be built in the coming years. About 400 of these were used by Americans and ISAF forces with the remaining 300 or so by Afghan National Security Forces. During the 1950s and 1960s, Afghanistan purchased moderate quantities of Soviet weapons to keep the military up to date. It was mainly Sukhoi Su-7, MiG-21 fighter jets, T-34 and Iosif Stalin tanks, SU-76 self-propelled guns, GAZ-69 4x4 light trucks of jeep class (in many versions), ZIL-157 military trucks, Katyusha multiple rocket launchers, and BTR-40 and BTR-152 armored personnel carriers. Also included were PPSh-41 and RPK machine guns. After King Zahir Shah's exile in 1973, President Daoud Khan made attempts to create a strong Afghan military in the Greater Middle East-South Asia region. Between 1973 and 1978, Afghanistan obtained more sophisticated Soviet weapons such as Mi-4 and Mi-8 helicopters, Su-22 and Il-28 jets. In addition to that the nation possessed great many T-55, T-62, and PT-76 tanks along with huge amounts of AKM assault rifles ordered. Armored vehicles delivered in the 1970s also included: ZIL-135s, BMP-1s, BRDM-1s, BTR-60s, UAZ-469, and GAZ-66 as well as large quantities of small arms and artillery. Under the Democratic Republic of Afghanistan (1978–1992), weapon deliveries by the Soviets were increased and included Mi-24 helicopters, MiG-23 fighter aircraft, ZSU-23-4 "Shilka" and ZSU-57-2 anti-aircraft self-propelled mounts, MT-LB armored personnel carriers, BM-27 "Uragan" and BM-21 "Grad" multiple-launch rocket systems and FROG-7 and Scud launchers. Some of the weapons that were not damaged during the decades of wars are still being used today, while the remainder have probably been sold on the black market. Construction of ANA base in Kandahar province. The United States has provided billions of dollars in military aid. One package included 2,500 Humvees, tens of thousands of M16 assault rifles and body armoured-jackets. It also included the building of a national military command center as well as training compounds in several provinces of the country. Canadian Forces supplied some ANA soldiers surplus C7 assault rifles but the Afghans returned the Canadian-made C7 in favor of the American-made M16 rifle, reason being that parts between the two rifles, despite being similar, are not fully interchangeable. Besides NATO, Afghanistan has been increasingly turning to India and Russia for assistance. Both countries have supported the Northern Alliance, with funding, training, supplies and medical treatment of wounded fighters, against the Taliban prior to 2002. India has been helping with several billion dollars invested in infrastructure development projects in Afghanistan besides the training of Afghan officers in India, but has been reluctant to provide military aid due to fears of antagonizing its regional rival Pakistan. In 2013, after years of subtle reminders, the Afghan government sent a wish list of heavy weapons to India. The list includes as many as 150 battle tanks T-72, 120 (105 mm) field guns, a large number of 82 mm mortars, one medium lift transport aircraft AN-32, two squadrons of medium lift Mi-17 and attack helicopters Mi-35, and a large number of trucks. In 2014, India signed a deal with Russia and Afghanistan where it would pay Russia for all the heavy equipment requested by Afghanistan instead of directly supplying them. The deal also includes the refurbishment of heavy weapons left behind since the Soviet war. The United States has also been largely responsible for the growth of the Afghan Air Force, as part of the Combined Air Power Transition Force, from four aircraft at the end of 2001 to about 100 as of 2011. Types include Lockheed C-130 Hercules and Pilatus PC-12 transport aircraft, A-29 Super Tucano attack aircraft, as well as Mi-17 troop-carrying helicopters and Mi-35 attack helicopters. The aircrew are being trained by an American team. The American intention is to spend around $5 billion by 2016 to increase the force to around 120 aircraft. As the size of Afghan Armed Force is growing rapidly so is the need for more aircraft and vehicles. It was announced in 2011 that the Afghan Armed Forces would be provided with 145 multi-type aircraft, 21 helicopters and 23,000 various type vehicles. As a Major non-NATO ally of the United States, Afghanistan is able to purchase and receive weapons from the United States without restrictions. In the meantime, the Afghan Air Force began seeking fighter aircraft and other advanced weapons. Defense Minister Wardak explained that "what we are asking to acquire is just the ability to defend ourselves, and also to be relevant in the future so that our friends and allies can count on us to participate in peacekeeping and other operations of mutual interest." ^ "Virginia National Guard's 29th Infantry Division mentors making a diff". ^ "Afghanistan Considers Conscript Army, To Mixed Reviews". rferl.org. Retrieved 2017-08-28. ^ a b c Karimi, Mohammad halim (September 11, 2014). "Mohammadi asks troops to stand united". Pajhwok Afghan News. Retrieved 2014-09-12. ^ C. J. Radin (2010-04-19). "Afghan Security Forces Order of Battle" (PDF). Retrieved 2017-08-28. ^ "Obama 'mulls Afghan army boost'". BBC News. 2009-03-19. Retrieved 2011-02-11. ^ Houtsma, M. Th. (1993). E.J. Brill's first encyclopaedia of Islam 1913-1936. BRILL. pp. 150–51. ISBN 978-90-04-09796-4. Retrieved 2010-09-24. ^ "Account of British Trade across the Caspian Sea". Jonas Hanway. Centre for Military and Strategic Studies. Retrieved 2010-09-24. ^ "Second Afghan War (Battle of Maiwand)". British Battles. Retrieved 2010-09-24. ^ a b "Second Afghan War (March to Kandahar and the Battle of Baba Wali)". British Battles. Retrieved 2010-09-24. ^ "First Afghan War (Battle of Ghuznee)". British Battles. Retrieved 2010-09-24. ^ "First Afghan War (Battle of Kabul 1842)". British Battles. Retrieved 2010-09-24. ^ "First Afghan War (The Siege of Jellalabad)". British Battles. Retrieved 2010-09-24. ^ Jeffery J. Roberts (2003). The Origins of Conflict in Afghanistan. Greenwood Publishing Group. pp. 75, 125. ISBN 978-0-275-97878-5. ^ Ali Ahmad Jalali, Rebuilding Afghanistan's National Army Archived June 9, 2007, at the Wayback Machine, Parameters, Autumn 2002, pp.72-86. ^ "Afghan Military Aid Said to Study In Soviet". The New York Times. November 11, 1981. Retrieved 2009-03-24. ^ J. Bruce Amstutz. The First Five Years of Soviet Occupation. DIANE Publishing. ISBN 978-0-7881-1111-2. Retrieved 2009-03-24. ^ "National Security". Illinois Institute of Technology. Archived from the original on 2012-07-23. Retrieved 2012-06-19. ^ "Country Profile". Illinois Institute of Technology. Archived from the original on 2001-11-06. Retrieved 2012-06-19. ^ "1988: USSR pledges to leave Afghanistan". London: BBC News. 1988-04-14. Retrieved 2009-03-21. ^ "Afghan Guerrillas Order Kabul Army To Surrender City". The New York Times. April 18, 1992. Retrieved 2009-03-21. ^ Tini Tran (January 24, 2008). "Brief with Commander, CAPTF". Department of Defense. Archived from the original on 2011-02-11. Retrieved 2009-03-13. ^ a b "India turns to Russia to help supply arms to Afghan forces". Reuters. 30 April 2014. Retrieved 2014-07-27. ^ a b "Afghanistan sends India a weapons wish-list ahead of NATO withdrawal". Mail Online. Retrieved 2015-05-11. ^ Pellerindate, Cheryl (May 23, 2011). "Afghan Security Forces Grow in Numbers, Quality". American Forces Press Service. United States Department of Defense. Archived from the original on 2014-04-14. Retrieved 2011-07-10. ^ "U.S. Builds Afghan Air Base, but Where Are the Planes?". The Wall Street Journal. 24 July 2012. ^ Turse, Nick (11 February 2010). "The 700 Military Bases of Afghanistan". Foreign Police In Focus (FPIF). Retrieved 2013-07-01. ^ "::DDR ::Heavy Weapons". Archived from the original on 2006-05-13. Retrieved 2015-05-11. ^ "India to pay Russia for arms, ammo it sells to Afghanistan". The Indian Express. 18 April 2014. Retrieved 2015-05-11. ^ "Afghanistan makes pitch for heavier weapons". Yahoo News. 18 October 2011. Retrieved 2015-05-11. Wikimedia Commons has media related to Military of Afghanistan.